An impeccably put-together, hot-rodded boutique take on a classic outline. Clean build, big neck, quality appointments, good sounds. The dual-voiced bridge pickup provides extra kick if you need. Neck pickup is slightly microphonic. Based in Hong Kong, and co-founded by Ryan Wong and Cho Shi Hyung, Vola guitars, which stands for the “voice of life and arts”, are made in Japan - there is limited USA ‘custom shop’ build, too, but those models aren’t currently available in the UK. Along with a range that covers traditional styles, as here, Vola leans into much more modern rock creations like the Floyd Rose-equipped Ares and Blaze X. For the most part body shapes are original and quite stylish. The Vasti recalls the Telecaster but retains that base cut-out, with an added chamfer, and pushes the treble horn cutaway in quite a BC Rich-like direction. Shapes aside, this guitar follows the classic Fender recipe. The body wood of ash is hidden under a solid colour finish. The edge radius is small and the body has a deep, but not quite vintage rib-cage cutaway. And, while there’s a scoop on the back of the treble cutaway, the body heel is old-style Fender with no chamfering or shaping. The guitar uses a 648mm (25.5-inch) scale length and the neck is one-piece maple with no separate fingerboard and a nicely vintage amber tint. Reflecting the more modernist style, the fingerboard radius follows jumbo-sized (approximately 2.84 wide x 1.2mm) gauge on the Vasti. The neck - which has a diagonal ‘rift sawn’ grain - is pretty big with a chunky ‘large C’ profile and 22 frets, the last fret seated on a fingerboard overhang. Fit and finish are superbly tidy: very typical modern Japanese build with not a hair out of place. Also typical is the Gotoh hardware. The Vasti’s Tele-style bridge, with three ‘In-Tune’ saddles, here in steel, not the more usual brass. Tuners, meanwhile, are typical Kluson-style but with Gotoh’s height-adjustable string posts, a string tree on the top two strings and nicely cut bone nut. There’s little innovation to the electronics. The Vasti’s covered neck single coil appears oh-so-Tele while the dual blade single coil-sized humbucker has a ‘power boost’ mode engaged by pulling up the master volume. Nicely weighted and with a very comfortable feel there’s encouraging resonance and clean quick attack, as you’d expect. But that’s not what’s going to make you go, “Oh!” No, that’s the relativity big, chunky neck - the Vasti measures 23.7mm at the first and bang on 25mm at the 12th fret. To put that in perspective, the depth at the first fret here is what Fender’s American Professional (and many others) measures at the 12th fret. There’s no fingerboard edge rounding, you’ll have to wear it in yourself, and the gloss poly finish, once the go-to for every manufacturer, begins to feel rather marginalised as so many makers employ satin, oiled wood, or simply worn ‘aged’ neck finishes. That said, it seems to be a light finish to the neck with very little, if any, build-up around the frets. Broadly speaking there’s not much you haven’t heard here before. The Vasti, yes, sounds like a Telecaster, and a good one at that. There’s good balance in all three pickup positions: the neck avoids sounding too veiled while the wider mix is distinctly different to those Strat-alike mixes with less ‘quack’ but a good hollowed voice nonetheless. The bridge is certainly steely sounding and with the volume pull- switch down we’re hearing the forward- facing single coil of the dual blade design. Lift up that volume pot, however, and the full humbucker mode takes over for quite a punchy volume increase. It makes for a strong, cutting and brightly voiced ‘rock’ Tele, although here - by design or not - the neck pickup is microphonic. We suspect it’s the cover that isn’t potted but it could cause you problems at high gain. Aside from the ‘power mode’ on the bridge humbucker there doesn’t seem to be any other hum-cancelling. The volume control has quite a quick taper which is nice enough for swift volume swells but might be too sudden if you’re the sort of player that sets their volume lower for clean rhythm. The tone control, meanwhile, is quite woolly when fully rolled back but that actually means there’s plenty of graduation to the pot’s travel. If you’ve been around guitars for any length of time you’ll no doubt appreciate Japanese craft. Okay, that might be a huge generalisation but we can’t remember moaning about Japanese build quality for many, many a year - if ever. So like Ibanez’s Prestige or John Page’s Classics, this Vola ticks the quality box and then some. 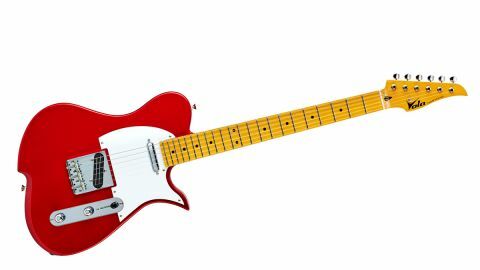 This guitar certainly uses the time-honoured Fender blend but at least Vola has given it a different aesthetic - which may or may not, of course, be a good thing. We can’t predict your taste but, shape aside, if you like classic Fender-style with a nicely meaty and big ol’ neck this is a perfectly weighted, comfortable guitar with reasonable colour choices and the sort of sounds the style and price suggest.